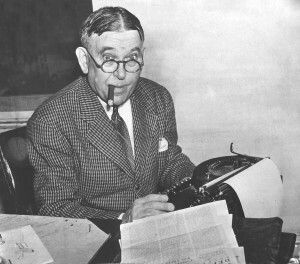 Henry Louis Mencken was a brilliant journalist and social critic, who— with great high spirits—lampooned organized religion, business, and especially the American middle class, which he dubbed the “boobocracy” or “booboisie.” Mencken made controversy fun. A penetrating literary critic, his influence on American literature—especially fiction—during the 1920s was profound. He was also a serious student of linguistics, and his massive study, The American Language (1919), is a monument of linguistics and also a delight to read.